• At the time of his daughter Fanny's birth in 1859, Edward's residence was Norton Street, Spittlegate. • Edward was a joiner, as noted on his daughter Fanny's birth certificate in September 1859. Enumeration forms were distributed to all households a couple of days before census night and the complete forms were collected the next day. All responses were to reflect the individual's status as of 7 April 1861 for all individuals who had spent the night in the house. People who were traveling or living abroad were enumerated at the location where they spent the night on census night. All of the details from the individual forms were later sorted and copied into enumerators' books, which are the records we can view images of today. The original householders schedules from 1841 to 1901 were destroyed. The clerks who compiled and reviewed the census data made a variety of marks on the returns. Unfortunately, many of these tally marks were written over personal information and some fields, such as ages, can be difficult to read as a result. • Fanny Dove/Dool, the Domestic Servant of the Reynolds household, was born in Speenhamland, Berkshire. This interesting-sounding place was the founding place of the Speenhamland System in early England. The 1601 Elizabethan Poor Law provided for each parish to raise a rate for the relief of poverty within its own jurisdiction; in 1662 the Settlement Laws restricted the obligation of the parish to looking after persons who had a permanent settlement there. In 1723 the Workhouse Test Act (Knatchbull's Act) obliged the poor to enter workhouses in order to obtain relief; Gilbert's Act (1782) excluded the able-bodied poor from the workhouse and forced parishes to provide either work or outdoor relief for this group of people. Indoor relief was confined specifically to caring for the old, sick, inform and dependent children. That it is not expedient for the Magistrates to grant that assistance by regulating the Wages of Day Labourers, according to the directions of the Statutes of the 5th Elizabeth and 1st James: But the Magistrates very earnestly recommend to the Farmers and others throughout the county, to increase the pay of their Labourers in proportion to the present price of provisions; and agreeable thereto, the Magistrates now present, have unanimously resolved that they will, in their several divisions, make the following calculations and allowances for relief of all poor and industrious men and their families, who to the satisfaction of the justices of their Parish, shall endeavour (as far as they can) for their own support and maintenance. That is to say, when the Gallon Loaf of Second Flour, Weighing 8lb. 11ozs [3.9 kg] shall cost 1s. then every poor and industrious man shall have for his own support 3s. weekly, either produced by his own or his family's labour, or an allowance from the poor rates, and for the support of his wife and every other of his family, 1s. 6d. When the Gallon Loaf shall cost 1s. 4d., then every poor and industrious man shall have 4s. weekly for his own, and 1s. and 10d. for the support of every other of his family. And so in proportion, as the price of bread rise or falls (that is to say) 3d. to the man, and 1d. to every other of the family, on every 1d. which the loaf rise above 1s. By order of the Meeting. W. BUDD, Deputy Clerk of the Peace. The idea spread rapidly in the south of England and it is thought that the system saved many families from starvation. Although Pitt attempted -- and failed -- to have the idea passed into legislation, this method of poor relief was not a national system. In the post-war depression after 1815 it was felt that there was a need to increase employment in rural areas in an attempt to reduce unemployment. The system was particularly common in the counties where the "Captain Swing" riots erupted in 1830. As time passed, contemporary writers such as Thomas Malthus said that the system tended to increase the population because it encouraged labourers to marry earlier than they might have done without the availability of poor relief. One of the effects of the Speenhamland System was that ratepayers often found themselves subsidising the owners of large estates who paid poor wages. It was not unknown for landowners to demolish empty houses in order to reduce the population on their lands and also to prevent the return of those who had left. At the same time, they would employ labourers from neighbouring parishes: these people could be laid off without warning but would not increase the rates in the parish where they worked. Farmers often were the same men who paid low wages and laid off workers; consequently, subsidising wages through poor relief drove wages down even further. What was intended as a safety net ended up causing many more problems. - work schemes: those claiming poor relief were put to work on (for example) road mending schemes. They were paid from the highway rate fund. However the contributors to this fund were the same people as those who financed the poor rates. - the labour rate: this was a separate rate levied on occupiers of the land. Employers could either pay their share of the rate or use their contribution to employ labourers who had a 'settlement', at the going wage rate. In 1832 the Employment of Labourers Act gave sanction to the labour rate: the Act expired on 25 March 1834 and coincided with the implementation of the Poor Law Amendment Act. The 1832 Act allowed a majority of 75% of the landowners in a parish -- voting in accordance with Sturges-Bourne's plural voting system -- to adopt the labour rate, provided that the JPs at the Petty sessions approved of the plan. The total labour bill for the parish was worked out by multiplying the number of settled able-bodied labourers by their 'supposed' market value and requiring each employer to hire a quantity of labour based on his rateable value or acreage. Those refusing to hire their quota of workers paid the difference in value into the poor rates. The labour rate was preferred to the 'demoralising' roundsman system by both landowners and tenant farmers who employed lots of men. However, the labour rate was denounced by the Royal Commission of Inquiry into the Poor Laws on the grounds that it did not distinguish between free and pauper labour. 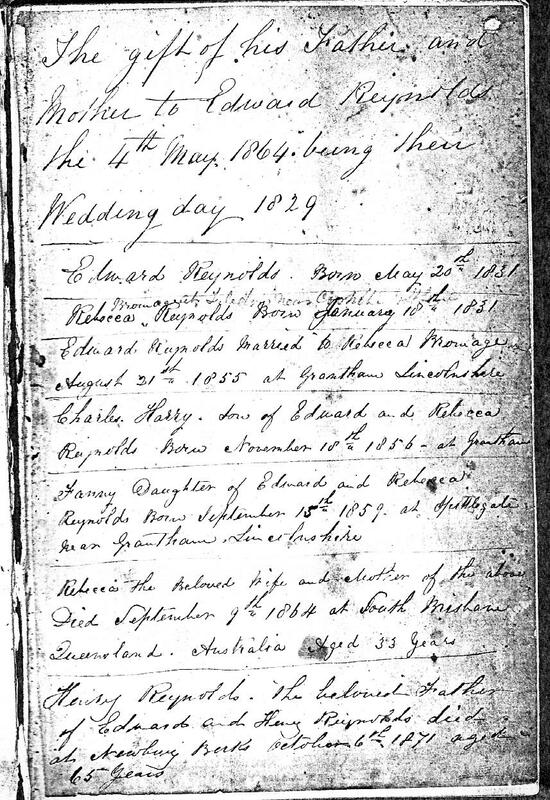 The gift of his Father and Mother to Edward Reynolds the 4th May 1864 being their Wedding day 1829. Edward Reynolds. Born May 20th 1831. Rebecca Bromage .. Born January 18th 1831. August 21st 1855 at Grantham Lincolnshire. Charles Harry. Son of Edward and Rebecca Reynolds. Born November 18th 1856 at Grantham. Fanny Daughter of Edward and Rebecca Reynolds. Born September 15th 1859 at Spittlegate near Grantham, Lincolnshire. Rebecca the Beloved Wife and Mother of the above. Died September 9th 1864 at South Brisbane Queensland. Australia. Aged 33 years. Henry Reynolds. The beloved Father of Edward and Henry Reynolds died at Newbury Berks October 6th 1871 aged 65 years. The 4th May 1864 is only ten days before Edward and Rebecca, and children, left London for their new life in Australia. It is most likely that this was a gift to the little Reynolds family from Edward's parents, Henry and Fanny. • Edward and his wife Rebecca left London, with their two children Charles Harry and Fanny, on the "Young Australia". It departed London on Saturday 14th May, 1864. • The "Young Australia" arrived in Brisbane on Tuesday, 16th August 1864. The journey took three months and two days. • Only three weeks after landing in Brisbane, Edward's wife Rebecca died. She had been ill for the entire journey, and was stated at her death to have been suffering from bronchitis and kidney disease for the three month journey. Rebecca was buried in the Wesleyan Cemetery, Brisbane, leaving Edward with their two young children, Charles seven, and Fanny - five years old. 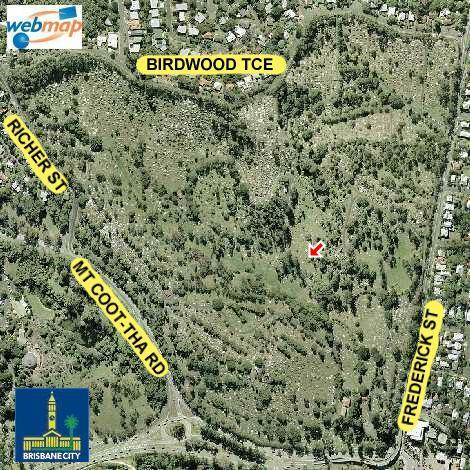 • Edward was buried in the Toowong Cemetery, Brisbane, on Wednesday 28th August 1907. • Already resting in the grave were Charles Stanley DYKE, buried on 29th March, 1885; Emily Etta LOGUE buried 1st December 1885; and Sarah Ann GWYNE 19th February 1894. Three and a half years later, Edward was joined by Mary Ann PLACE (aka REYNOLDS) on 31st March 1911. 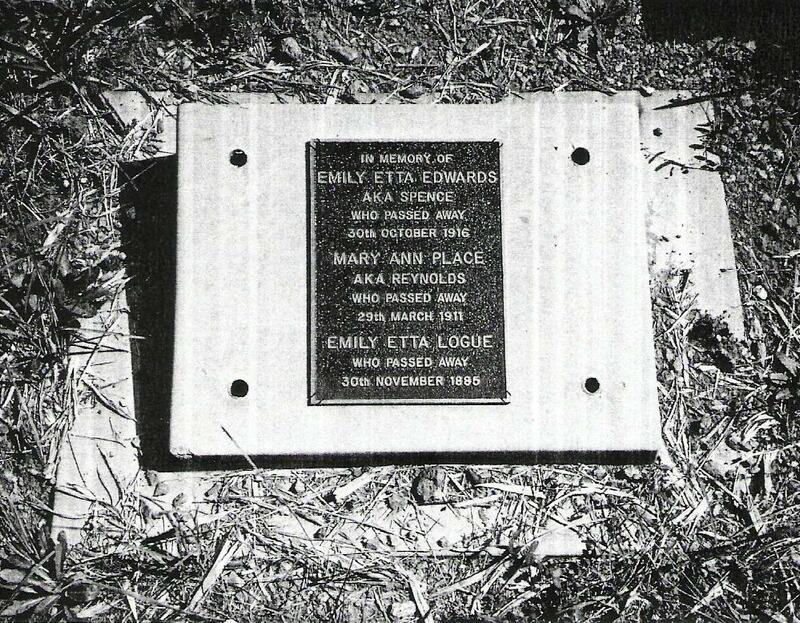 Finally, five and a half years after that, Emily Etta EDWARDS (aka SPENCE) was laid to rest in the same grave, on 30th October 1916.